Spiritual Evolution of the Bean: Win an Original Piece of Biffybeans Art! Just love your art, your reviews, and your apparent devotion to Lamy. :) Cheers, biffy. The Bearcat would really like this. I've been meaning to see if I could get one of your great Mandalas, but this is even better! I'd love to win a work of art. Let those random numbers ROLL! Pick me me me! Gorgeous! Nice artwork. 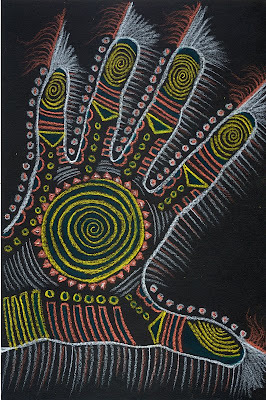 It reminds me of Australian indigenous art. Well, I did not have ANY piece of art so this would be my first. hopefully. I love your art, and I would love to win a piece of your art even more. Maybe I'll be lucky! Would definitely love to have this piece - beautiful!! Just found your blog the other day while looking for fountain pen info and have been back a couple times since. Enjoy your pen reviews as well as your art. Thanks for this wonderful blog. @Caroline. I use Safari and I get the same problem - I think it's a bug because I've found a work around - if you click Preview, wait for that to load and then click post comment, it seems to work. and... OH OH OH *raises hand excitedly* Pick Me Pick Me Pick Me!!!!! I'm not expecting a win here (I'm one of those people who never win anything - not a pity party, just sayin'!) so ARE any of your Mandala art pieces available for sale?!?! I look forward to your tweets everyday, alwayss good fp remarks. I love that you are a musician, your creativity is multi-faceted. Your art will be very appreciated and well cared for as I have spent my life with a graphic designer/drummer. Yay! Always up for some Biffy Beans art! I've got nothing to add but this useless comment! The art is great, btw. I am a frequent BB dot com visitor; your blog is not only a place where I get good paper/pen/ink information, it's also a place to get a lot of inspiration from.